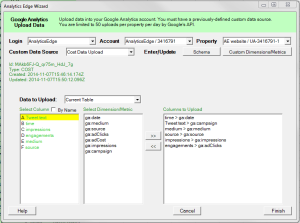 To upload data into Google Analytics, select the Property and Custom Data Source (see Google Analytics help for details about custom data sources and uploading data). CAUTION: read the information in Google Analytics Help regarding data upload before using the Analytics Edge upload feature. You can enter the schema for the data source by clicking the button provided. You can also import any custom dimension and metric definitions to make it easier to map the columns. Select the source of the data to be uploaded, then map the various columns from the source to the columns in the schema. NOTE: you need to match the schema of your data source; by default, Analytics Edge will list all possible fields. if you use fields that are not part of the selected data source schema, the extra columns will not be uploaded. Once you have mapped all of the fields, click Finish. A dialog will appear giving you a 5-second countdown to cancel the upload. 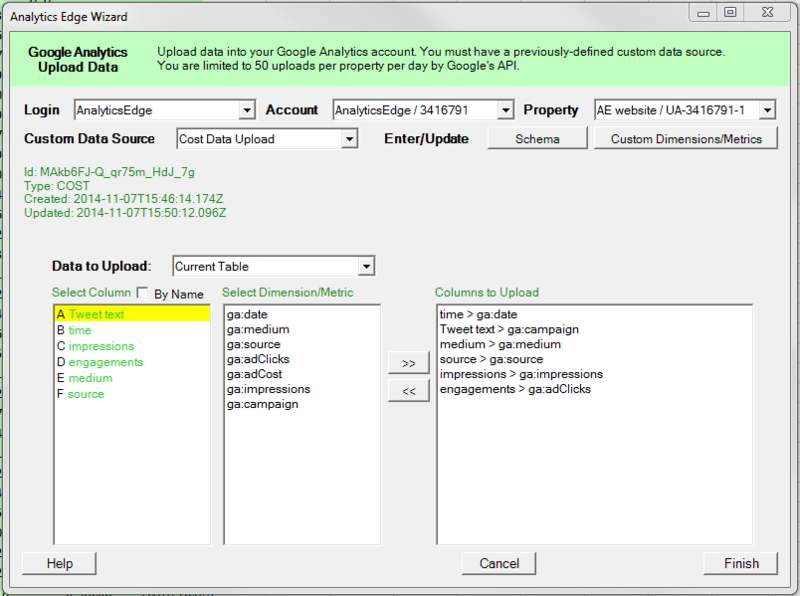 To delete a upload after it has been completed, you will need to do so from the Google Analytics Admin interface. This entry was posted in Google Analytics on 2014/11/09 by functions.